Micro-irrigation or “localised irrigation” also known as drop by drop irrigation, comprises distributing water through a network of low pressure pipes, providing water to the immediate proximity of any plants grown. This is an irrigation method suited to arid areas for it allows significant water savings when compared with conventional surface irrigation methods. It can be combined with irrigation scheduling that comprises planning irrigation flow rates, times and cycles based on seasonal and daily variations, climate conditions and types of crops, with the aim of reducing water consumption to the minimum. Micro-irrigation has been in use for a long time in gardens as pierced rails, then the method started to take off in the early 60s. It is especially used in fruit and wine growing and in horticulture. The technique was taken up widely in arid climate areas or ones where there is a lack of water available for irrigation, as is the case in Spain, California in United States and in Middle Eastern countries. Since the end of the 90s, micro-irrigation has started to expand into irrigation for small family farms in many West African countries. Nevertheless, it is still not found very extensively (used for less than 2% of the worlds cultivated land area, worldwide) due to the cost of the equipment required. The growth in the world’s population presents a major challenge for today’s and tomorrow’s generations : How to sustainably feed the planet’s entire ? Agriculture uses some 70% of the world’s water consumption. In poorer countries, this figure may be even higher. Secure food supplies therefore rely on the availability of the amount of water needed for agricultural production. Many countries are faced with a growing scarcity of hydric resources, reducing agricultural production and increasing the cost of the works required for irrigation. For this reason, recourse to methods that allow less water to be used is a necessity. The table below shows the various yields (ratio between the amount of water required for growing and the amount of water to be supplied) depending on the irrigation mode used. It allows us to conclude that micro-irrigation can reduce water consumption by 20 to 40% compared with conventional methods. Today, most irrigation uses gravity feed surface approaches like the flooding or runoff methods. These methods offer considerable room for water savings by replacing them with methods that will reduce the losses as the water is applied. Furthermore, a large part of the water applied is added without any prior planning, leading to excess consumption and therefore considerable waste. Implementing more efficient techniques may generate significant economic gains in countries where hydric resources are limited and where the cost of water is highest. 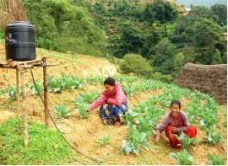 These techniques may be implemented on a large scale in regions that are economically developed but poor in water or for small scale family type farms in developing nations. 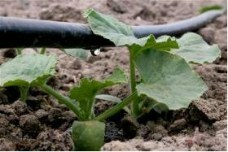 Micro-irrigation comprises bringing water as close as possible to plants. This approach differs from conventional processes in that only a fraction of the ground is watered and then only with a small amount of water, requiring only low pressure levels and therefore only fairly lightweight equipment. A number of techniques have been developed for this purpose, including drop by drop watering using drop emitters and micro sprinklers that use micro sprinklers and, more marginally, porous pipes. Drop emitters are mechanisms that bring water on demand at low flow rates (2 to 12 litres per hour) at a pressure of around 1 bar. The water comes through very small holes (1 to 1.5 mm), or by running water through very small cross-section tubes (0.5 to 1.5 mm) over long lengths (0.1 to 1.0 m). The drop emitters are usually made from PVC. Drop emitters with openings have a high risk of becoming clogged. There are self-regulating drop emitters using springs and other mechanisms so as to keep the flow rate relatively constant over a given pressure range. Micro sprinklers are installed on the pipes and therefore very close to the ground, serving only to spray the actual area where the crops are growing, with a range of 1 to 2.5 metres. The amounts of water provided are greater than when using drop emitters, varying from 10 to 60 litres per hour. This technique is very widespread in arboriculture. The third technique is to use porous pipes that release water into the ground along their entire length. 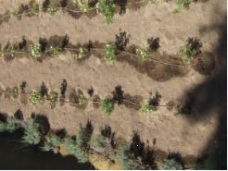 Nevertheless, the risk of clogging, the irregular flow rates and the fact that at the start of the vegetation cycle plant roots are not deep enough to be feed from this pipe are all typical drawbacks. In all cases, the water used for micro-irrigation purposes must be filtered to minimise any risk of clogging. To minimise water consumption, programmed irrigation may be envisaged. This comprises determining how much water is needed, for how long and at what times of day (preset timed programming). A number of these parameters are affected by weather related factors (temperature, humidity, sunlight), soil properties (degree of seepage, slope) and by the kind of crop as well as the plant’s growth phase. Programming may then vary from one day to the next, depending on weather conditions, requiring the system to be run by skilled personnel. For large scale farms, more sophisticated programming can be envisaged so as to take all of these parameters into account along with the skilled personnel. - The best periods for irrigation are the early morning or late afternoon. When the sun is higher, around noon, most of the water is lost to evaporation and during the night it accumulates on the ground and this is not good for plants. - The amount of water must be sufficient to meet the plant’s needs, based on ground properties, weather conditions and the kind of crop. Excessive watering may be just as big a problem as a lack of water. - When it rains, scale back or even stop the irrigation system. To determine the amount of water brought by the rain, simply measure the water column height accumulated in a cylindrical container exposed to the rain. This measurement can give you an idea of the amount of water that still has to be provided by irrigation when compared with the equipment’s flow rate. - Regularly inspecting the piping is important so as to detect any leaks or breaks as soon as possible, thereby limiting any water losses. Advantages : The main advantage lies in water savings, but also in fertiliser savings as it can be added directly to the water. Ease of use and maintenance. This approach also saves labour as only one person is needed to water an entire plot (as the only actions required are opening and closing the valve). Drawbacks : The initial cost of the installation is a relatively high one. However, fairly low cost equipment suitable for small areas is now available. The person in charge of operation must have received training to ensure suitable use. Fully automating large areas is a complicated task. Factsheet E 52 provides unit prices for piping and drop emitters. For small areas, a number of vendors offer drop by drop systems in kit form suited to the surface area to be irrigated. Standard kits have been designed for surfaces of up to 500 sq. metres. A number of kits can be mounted in series for larger areas. Depending on the vendors and destination country, the price a 500 sq. metre kit by itself is some 200 Euros. On the other hand, the total cost of an installation with a treadle pump, 2 cu. metre tank and 500 sq. metre kit is between 500 and 1,000 Euros). The main recommendation is proper network design, in terms of choice of flow rate and drip emitter or micro sprinkler spacing as well as irrigation management. The latter function needs to continually provide the amount of water required by the crop, but without excess. The water used must be filtered to avoid any risk of clogging drip emitters or micro sprinklers. The filtration station must be effective and reliable. An example of best practice is described in Factsheet E 52 covering a micro-irrigation application for growing beets in Turkey. - The United Nations Food and Agriculture Organisation (FAO) : Reports are available in both English and French. 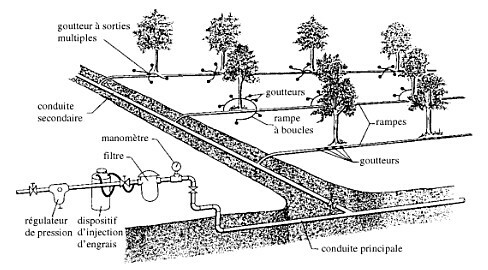 - A very detailed French language FAO manual on implementing micro-irrigation and spray techniques. - A highly detailed English language FAO manual on estimating plant water needs.